Fully articulated, 8-inch tall Sawyer and Juliet Burke Action Figures! Special edition action figures are individually numbered and limited to just 1,000 pieces each! Based on the epic Lost TV series. Real fabric clothing and a 1970s retro style. They make excellent collectibles and appreciated gifts! Entertainment Earth Comic-Con Debut! 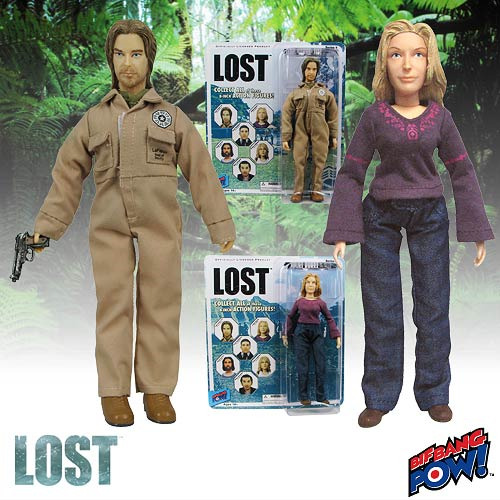 If you've been searching for action figures from Lost, search no more. They're right here! Each fan-favorite character stands 8-inches tall in a retro action figure style. With fabric clothing and multiple points of articulation, these figures are incredible. Each figure comes individually carded in clamshell packaging. You'll want to discover them all! Limited edition of 1,000 pieces. Note: This item will first be available to purchase in person at San Diego Comic-Con. Online orders will ship after San Diego Comic-Con in late July, 2011, while supplies last. A Dharma Security version of Sawyer and a special 70s version of lovely Juliet Burke are showcased in this super case of retro-styled action figures from ABC's Lost series. They make quite a couple, do they not? You'll want to discover them all!